Mr. Bradley performed at the Country Music Hall of Fame Medallion Ceremony in Nashville in 2007. 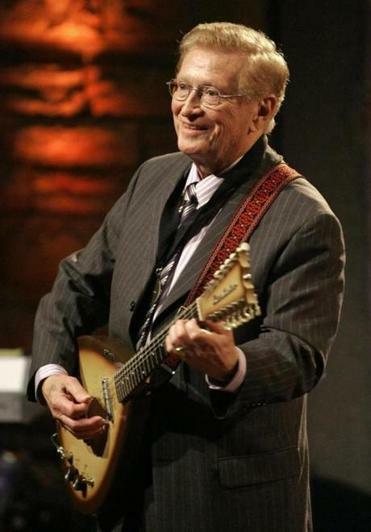 NASHVILLE — Harold Bradley, who played on thousands of country, pop and rock ’n’ roll recordings, including landmark hits like Brenda Lee’s “I’m Sorry,” Patsy Cline’s “Crazy,” and Roy Orbison’s “Only the Lonely,” died Thursday in Nashville. He was 93. His death, at Vanderbilt University Medical Center, was confirmed by his daughter Beverly Bradley. Beginning in the 1940s, Mr. Bradley’s work on six-string bass and guitar was also featured on records by, among many others, Red Foley, Hank Williams, Elvis Presley, Buddy Holly, the Everly Brothers, and Loretta Lynn. Mr. Bradley, known for his spare, soulful playing, also played banjo and other instruments. But according to Guitar Player magazine and other sources, he is among the most recorded guitarists in history. “Clear as country water” is how that song characterized the intuitive, uncluttered playing of the team under Mr. Bradley’s direction, an expansive ensemble that also included pianist Floyd Cramer and pedal steel guitarist Pete Drake. By the late ‘60s, the group’s laid-back, no-frills approach drew folk and rock luminaries like Bob Dylan, Joan Baez, and the Byrds to Nashville to record with them. “Everything that was happening in the studio — that was my world; that was as big as it got,” Mr. Bradley said, looking back on Nashville’s 1950s and ‘60s heyday in a 2013 interview with NPR. Although he was a capable lead guitarist, Mr. Bradley made his mark as a rhythm specialist. His signature style featured a clicking, propulsive figure, often performed on six-string electric bass, that mimicked the lines of the acoustic bass. Known among industry insiders as “tic tac,” Mr. Bradley’s less-is-more approach furnished the supple rhythm bed for both Eddy Arnold’s “Make the World Go Away” and Tammy Wynette’s “Stand by Your Man.” In the process he helped shape not only the pop-inflected “Nashville sound” of singers like Arnold and Cline but also the more soulful “countrypolitan” sound of Wynette, George Jones, and Conway Twitty. As accomplished an entrepreneur as he was a musician, Mr. Bradley, with his brother Owen and Owen’s son Jerry, was among the first to build independent music studios on Nashville’s Music Row. By 1955 the three of them had merged their initial two ventures into Bradley Film and Recordings Studios, a musicians’ haven more commonly known as the Quonset Hut. During its first months of operation, the Quonset Hut produced blockbuster hits like Gene Vincent’s “Be-Bop-a-Lula,” Marty Robbins’s “Singing the Blues,” and Sonny James’s “Young Love.” By the time Columbia Records purchased the facility in 1962, the Bradleys, along with visionary record executives like Chet Atkins and Don Law, had established Nashville as a major recording center. Later in his career, as subsequent generations of studio players rose to prominence and he worked fewer sessions, Mr. Bradley became active in the Nashville chapter of the American Federation of Musicians. From 1991 to 2008 he was the union’s president. He was vice president of the international division for more than a decade. Mr. Bradley was elected to the Country Music Hall of Fame in 2006. He was the first instrumentalist without a significant career as a solo artist to be so honored. Harold Ray Bradley was born on Jan. 2, 1926, in Nashville, one of six children. His father, Vernon, was a salesman for Cumberland Tobacco Works for 46 years. His mother, Letha Maie (Owen) Bradley, was a homemaker. Mr. Bradley first learned to play the tenor banjo, but he switched his focus to guitar after his brother Owen observed that guitarists were in greater demand than banjo players. At 17 he became lead guitarist in Ernest Tubb’s band, the Texas Troubadours. After serving in the Navy from 1944 to 1946, he returned to Nashville and began playing in his brother’s local dance orchestra, which featured future pop stars Snooky Lanson and Kitty Kallen as vocalists. Mr. Bradley worked his first studio session in Chicago in 1946, recording with Grand Ole Opry star Pee Wee King and his Golden West Boys. He did not make his Nashville session debut until four years later (the city would not emerge as a recording hub until the 1950s), when he played acoustic guitar on Red Foley’s “Chattanoogie Shoe Shine Boy,” a No. 1 country and pop hit. In addition to his daughter Beverly, Mr. Bradley is survived by his wife of 66 years, Eleanor Allen Bradley; another daughter, Bari Bradley Brooks; and two grandchildren. Although he released three instrumental albums under his own name, Mr. Bradley regarded himself primarily as a contributor to the work of others. “We had a setup,” he said, reflecting modestly on his decades as a session musician in Nashville in 2013.